One of the greatest joys of my work in ministry is helping people discern their call to join the Catholic Church. This year we are blessed to have 16 men and women who have indicated their desire to join the faith, who are on a journey of faith through our Emmaus Road Ministry. They meet weekly, lead by an awesome team of volunteers, where they are taught how to pray, what the Church teaches, and how to accept God’s call to the faith. This is done through a series of videos complimented by personal witness talks given by the team members and opportunities to share in group discussion. The focus of this journey is to teach them of God’s love for each of them and to help them develop their own relationship with God. Throughout this process there are opportunities for them to stand before the parish community and ask for prayers of strength as they journey towards becoming a fully initiated member of the Church. It is a powerful witness for all. Our group is separated into two categories: candidates and catechumens. A candidate is a person who is already baptized in another Christian faith, and a catechumen is a person who has never been baptized. In both cases they have expressed a desire to learn about the Catholic Faith with the hopes of being fully welcomed into the church through the celebration of the sacraments. A candidate prepares to make a profession of faith and receive the Sacraments of Reconciliation, Confirmation and Eucharist. A Catechumen prepares to be Baptized, and receive the Sacraments of Reconciliation, Confirmation and Eucharist. On the First Sunday of Lent, our 10 Catechumens participated in a celebration at St. Peter’s Cathedral Basilica with Bishop Fabbro called The Rite of Election. During this celebration, all the parishes in the Diocese of London present to the Bishop in person their Catechumens. As each name is called out they individually stand and state their readiness to be Baptized. They then process to the altar to sign their name in the Book of The Elect which is then signed by the Bishop, who then declares that they are no longer catechumen, but now The Elect. He invites them to take time during Lent to pray, fast and offer acts of charity as they prepare for the Easter Vigil at which time they will be Baptized. It was a very moving celebration for our catechumen, and a step closer to becoming full members of the Church. We Congratulate and pray for our new Elect as they prepare for their Baptism on April 20th: Joanthan Bauer, Kim Bushey, Andrea Coutu, Kelsey Craig, Monica Dejean, Amanda Gellel, Kate Greenwell, Bronze & Grace Wang and Avery Wong. Ordinarily both groups are received into the Church at the Easter Vigil, however, this year due to the large numbers we decided to offer two celebrations. Our Easter Vigil Celebration takes place on Saturday April 20th at 8 pm. This celebration is what I like to call the Super Bowl of the Catholic Church so please join us. On Sunday, March 24th at the 9:00 AM Mass, our Emmaus Road (RCIA) candidates who had already been Baptized in another Christian religion stood before the community, made a Profession of Faith and received the Sacraments of Confirmation and Eucharist which completed their journey of full initiation into the Catholic Church. 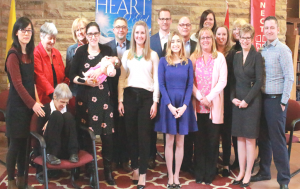 It was a wonderful witness of faith for the whole community We welcome into our parish family: Alynn Clark; Elyse McCorquodale; Carly Soanes; Debra Hurley; Jena Downen-Dempsey; and Walter Gough. We also celebrate with Martha Chisholm, of our L’Arche Community, who received the sacraments of Confirmation and Eucharist. We congratulate all of them and pray that they will continue to discern God’s call as they participate in the life of the Church. They will support their faith companions who will be Baptized at the Easter Vigil by participating as lectors and ministers of hospitality which will be their first opportunity to serve in ministry in their new faith community. This program would not be possible without the gift of our team members and sponsors. Thank you to all of you who have shared your gift of faith and accepted the call of Growing Good Seed to form these intentional disciples. I am so proud of our parish community and I thank God everyday .